Part 3 covers how to start up the web server and connect to your WiFi network. When you have done that successfully, you will be presented with the home page. It is the gateway to the configuration and motor control, and we have reproduced it here, so that you can read the introduction. 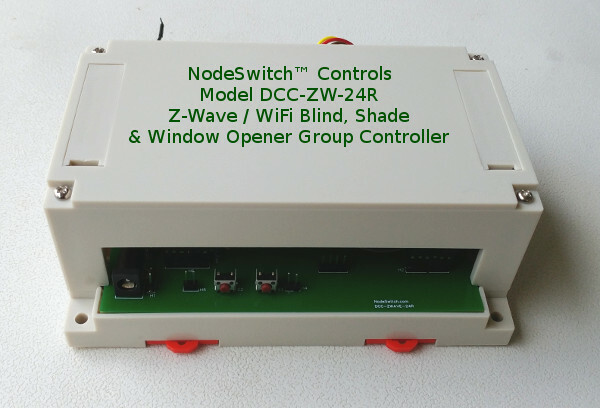 This blind control kit is a single channel GROUP controller for motorized blinds, shades, window openers, curtain closers, skylight shades, and other devices. Whether you have 2 or 200 motors in the group, it will control all the motors in the group simultaneously, and each motor can have its own individual travel limits. Use a ZWAVE hub, such as SmartThings or Vera (Z-Wave is the default mode of this unit). These hubs usually have voice interfaces for systems such as Alexa or Google Home. Use any WiFi enabled device with a browser, such as phone, tablet, or laptop (note that WiFi is used to configure the group operation of this controller). Use our wall mount and hand held remote controls. Our customers often use wall mount remotes at room entry points. Use our RF/IR BroadLink hub, with its own Android or iPhone app. It can also be used with Alexa or Google home; please see this article. Please note that Z-Wave and WiFi are mutually exclusive methods of operation. If you have selected Z-Wave control in the CONFIGURE GROUP area, when you return to MOTOR CONTROL, this web interface will disappear. During normal Z-Wave operation you would use the interface for your Z-Wave hub to control the motor group. If you want to change some settings, you can activate this web interface again by holding down switch 4 on the controller for a few seconds (long press). Please see the complete instructions at our website: NodeSwitch.com (look at the "How To" area on the MAIN MENU). This unit is powered by a fast, dual core Wi-Fi microchip with plenty of memory and control inputs/outputs. From a cold start this device can be online, connected to your WiFi network in under a second! If you are reading this, you are already connected to the WiFi control console hosted on this microchip. Although the primary function is intended for controlling blind motors, this unit is highly configurable via the CONFIGURE GROUP menu button below. It can be used for our electric window openers, or any other DC motor that is capable of reverse operation (we have receiver modules too). If you are interested in modifying the programming or functionality of these units, please note that we have a series of educational kits based on this microchip. HOME The default mode for this controller is Z-Wave, but this home page is loaded after you long-press the S3 switch to power up this controller into its WiFi mode. Please follow the initial instructions to configure your WiFi settings to get an IP address on your local WiFi router (the IP Address on this unit is currently 192.168.1.7). This page provides introductory information about the controller, with links to the other files shown below. CONFIGURE GROUP This page allows you to set timing parameters and control screen wording that affects how this group behaves. There are hints on the page that provide assistance for each setting. MOTOR CONTROL If you choose the WiFi mode of operation, instead of Z-Wave motor control, you will have access to our interactive slider. You can set the percentage of travel with the interactive slider, or roll the shade to its fully deployed or fully retracted position, and you can also STOP the motor anywhere ). If you select the Z-Wave mode of operation (in the GROUP CONTROL settings), you would use the control interface provided by your Z-Wave hub.